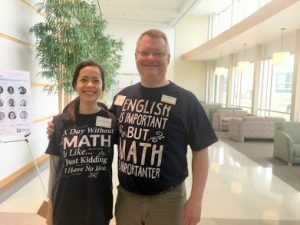 Join us, as John Tyler Community College, in Midlothian, VA, will be hosting the 2019 Virginia Mathematical Association of Two Year Colleges Conference. We are excited to announce that Dr. John Adam, Mathematics Professor/University Professor at Old Dominion University will be our keynote speaker. Dr. Adam has been at Old Dominion since 1984 and has published approximately 110 papers and six books. His talk will be on “Mathematics in Nature” including rainbows, halos, cat paws, and more. You can read his bio at https://fs.wp.odu.edu/jadam/. VMATYC is looking for presenters for this year’s conference. With changes continuing to come from the VCCS, there are many things to present and discuss. Please consider presenting or conducting a workshop or roundtable. We have had at least a full year to teach MTH 154 and MCR, so how are things going? Please share your experiences. What pedagogies have you found successful in your developmental and credit courses? What technologies are you using to improve student success? Please share projects that you are using in your courses or something that you found valuable to share with colleagues. Presenter applications must be submitted by October 10 to guarantee a spot on the program. Applications are available here: Presenter Application Form. The conference registration fee is $40 for all VMATYC members or any state AMATYC affiliate member. The conference registration fee for any non-VMATYC member is $65, which includes the $25 VMATYC membership fee. Please register for the conference by October 17. Attendees can register online and pay the appropriate conference fee and membership dues here: Fall Conference Registration. Rooms have been reserved at the Holiday Inn Express at two locations. Both are within seven miles of the college and priced at the state government rate of $94/night with breakfast included at both locations. Reserve your room by contacting either hotel and requesting the “VMATYC” room block. For taxes in Richmond/Midlothian, add 13.3% to the per night room rate quoted above. Make your reservations by October 1 to guarantee the above rate.